I noticed lately there is a lot of programs and curriculum that have emphasis on fast learning, colorful and entertaining ways to teach and not to teach. My son tends to lean towards fast action shows, and games to keep him interested while my husband and I are trying to move him away from needing this kind of stimulation in order to learn. 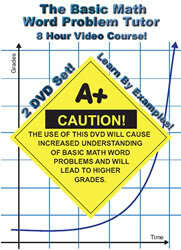 I was so happy to come across this DVD system called “The Basic Math Word Problem Tutor” by MathTudorDVD.com to help teach the basics in math. When I put this into the DVD player for the first time, I was expecting that style of learning but I was happily surprised it wasn’t like that. I really enjoyed watching the gentleman explain what was needed to learn and master the skills he was teaching without all the splash. It was simple to follow along and my oldest son really understood what he was talking about. Basic Math Tutor is an 8 hour DVD with two disks. Word problems have been a struggle for sometime with my oldest son, trying to figure out if it’s an adding question or a subtracting question and so forth. This DVD really helps explain how to decipher what the problem is asking of you by using key words in the text. He is easy to understand and gives many practice problems to help enforce each concept. Great for any child learning word problems or a great tool to use to reinforce these concepts. You can go to his website @ Math Tutor DVD to learn more. I was searching through this site and came across your review. We’re so glad that you found our Word Problem DVD so helpful! Thanks so much for all of your kind words. If you’re interested, we’d love for you to take a look at another one of our titles and write about it. Just e-mail me back at [email protected] and let me know if you’re interested.